Hello everyone! It's been a week and I wanted to update on here <3 School is now out for the year, congratulations to all you graduates! Working at a school has prepared me for June, the month of new beginnings! This is actually my first year in a yearbook, so I'm very excited to receive it! The students won't be in the school anymore and it'll just be a few faculty members working throughout the summer... myself included. I'm excited about this because there's lots of exciting things to work on for the next school year! I've been focusing a lot on work lately so there isn't much going on besides that, but I did want to share a few things! Today was my first day with a different schedule than I've had all year, so my friend and I decided to go out and have a good time! 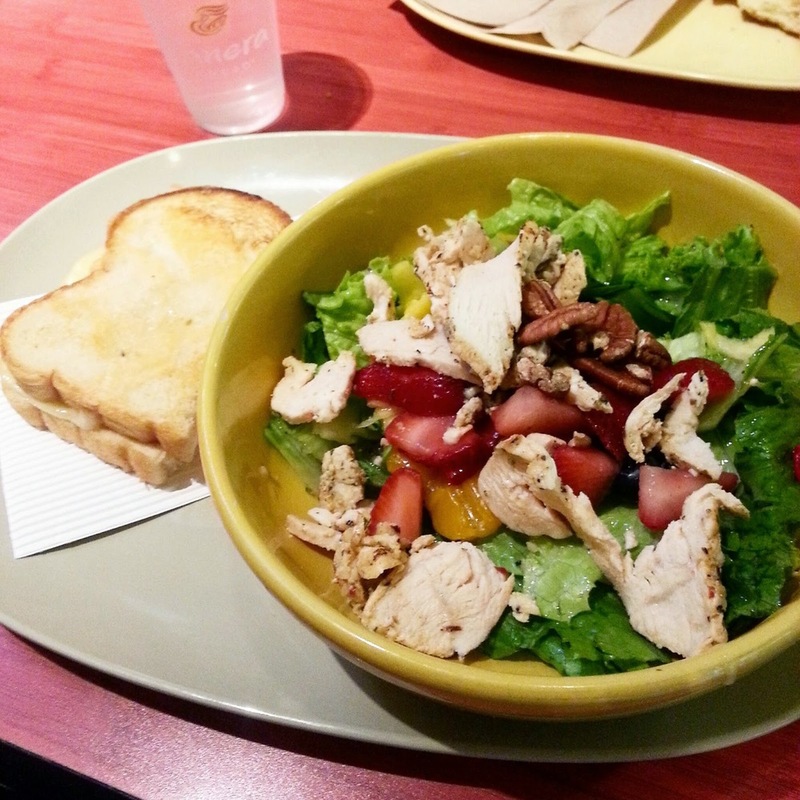 We stopped at Panera and let me just say my newest obsession are salads with fruit and a sweet dressing. I never thought I would like salads like these but wow I can't stop eating them!!! If I see them on a menu I order them without looking at the rest of the options. This is a definite favorite for the summer. On our girl date we decided to be cool kids and take out our makeup bags and take pictures! 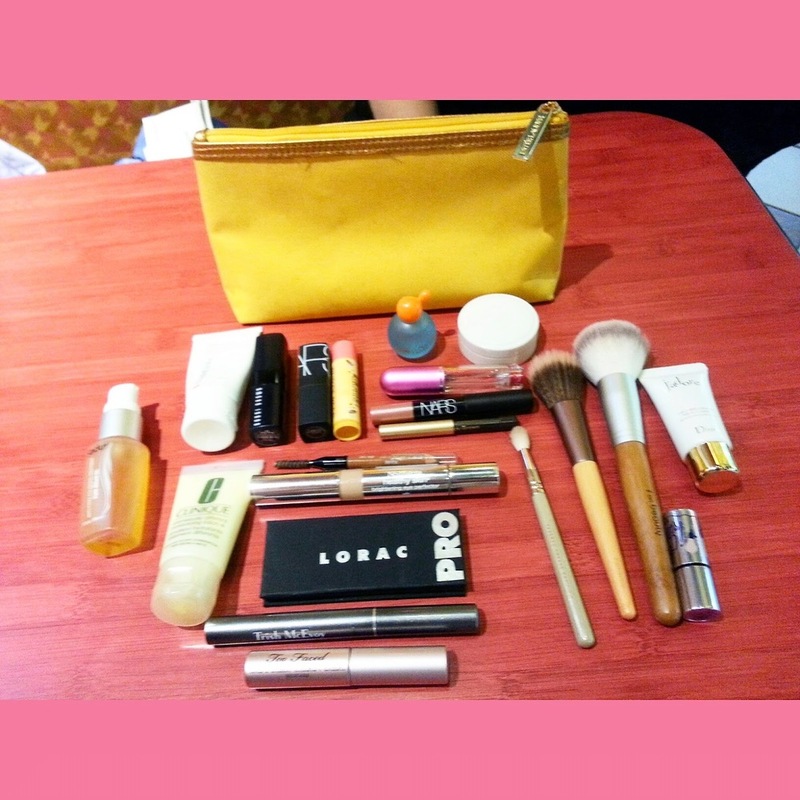 She actually has a makeup bag now and I love her taste in makeup so I was really curious to see what she had. And mine is the one with Vera Bradley! From left to right, I have some hair stuff, a necklace a student gave me with our school symbol on it, Sparkle Teeth Tablets from Lush that whiten your teeth after drinking coffee or something, My Escada Paradise perfume, Baby Lips, Clinique hand lotion, a Clinique rose lipstick and mascara Bare Minerals eyeshadow for touch-ups, , Pantone Universe lip gloss, a Sephora mini mirror, my Chanel lipstick and a Revlon lip gloss. I keep everything in a Vera Bradley makeup bag. And of course the entire point of our trip was to pick up some makeup from Ulta. I've never actually gone before and it was a pretty positive experience. I picked up my new summer scent which could very possibly be my new signature scent. It's been Escada's Cherry in the Air but they discontinued it and if they ever make it again I would totally switch back, but I gotta say I fell in love with Dolce and Gabbana's Rose the One. It's the sweetest smell of roses and ~sophistication~ and while walking around the store I couldn't stop sniffing myself XD Once again I left the Naked 3 and opted for Lorac's Unzipped. The colors in this palette are so, so beautiful and I know I'll use every color (how many natural colors can a girl have before it becomes ridiculous?) It also comes with an eye primer (which I don't use but now I have a small sample of primer AND eye primer so I guess there's a first time for everything?). I was very happy to be able to splurge... but yeah this was a definitely a splurge day.